Saudi government lied about the number of deaths in stampede. It now stands at over 2,400. The estimated death toll from a stampede at the hajj three months ago surpassed 2,400 on Thursday, widening the gap with Saudi Arabia’s publicly announced figure and raising new concerns about why the kingdom has not yet reported its own inquest into the disaster. The latest figure, 2,411, reported by The Associated Press, was based on what the agency described as its updated compilation from state news reports and official remarks from 36 of the more than 180 countries where pilgrims had traveled from. If confirmed, the toll would make the stampede the worst in the history of the hajj, the annual five-day pilgrimage that Muslims aspire to complete at least once. The A.P. and other global news agencies, including Reuters and Agence France-Presse, have been periodically increasing their estimated death tolls since the Sept. 24 stampede, based on the same general methodologies of compiling official figures from the victims’ home countries. The Saudis, by contrast, have asserted almost from the beginning that 769 pilgrims died in the stampede, which took place about three miles east of Mecca, when crowds became trapped on narrow streets. While the Saudi king, Salman, ordered an immediate investigation, there has been no update on its progress. 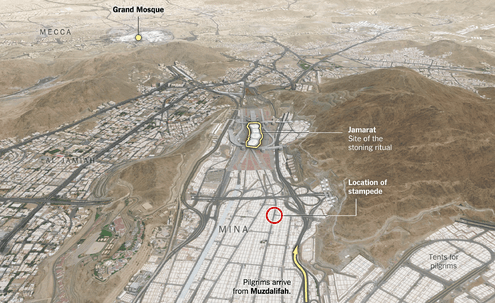 Maps showing where more than 700 people were killed in a stampede near Mecca, Saudi Arabia. Nor has there been any clarity from the Saudis regarding the initial contradictory accounts of what happened. Some officials at first appeared to blame the victims saying they did not follow instructions, but witnesses described exits closed inexplicably that might have induced a panic. A virtual news blackout on the disaster has prevailed in Saudi Arabia’s news media since. The king’s presumed successor, Crown Prince Mohammad bin Nayaf, is head of the Interior Ministry, which oversees the hajj. The finding of any negligence could cast aspersions on him. Political experts and historians have attributed the Saudi response to the ruling family’s sensitivity over its self-appointed role as the guardian of the holiest sites in Islam, as well as its enormous investments to accommodate millions of religious tourists. Nearly all of the victims were from countries in the Middle East, Africa and Asia. Iran, Saudi Arabia’s regional rival, is believed to have lost at least 464 pilgrims, the most of any country, and the disaster has constituted a major new irritant in the countries’ relationship. Others with casualties exceeding 100 include Mali, Nigeria, Egypt, Bangladesh and Pakistan, according to The A.P. and other estimates. Jon Gambrell, the Dubai-based A.P. correspondent who reported the latest tally, said by telephone that the toll was derived from state news reports and data from officials of the home countries. Saudi officials in Riyadh, the capital, could not be reached for comment. A spokesman for the Saudi Embassy in Washington declined to comment. Toby C. Jones, a professor of Middle Eastern history at Rutgers, said he was not surprised at the Saudi reluctance to give information on what could be a catastrophic case of negligence. Previous Previous post: Is Mark Zuckerberg’s new charity a thinly-veiled tax shelter? Next Next post: Humanist mayor in the U.S ditches bible and takes oath of office over the constitution.